Some food combinations go better together than others. Bananas + Caramel are a match made in heaven and pair beautifully together. 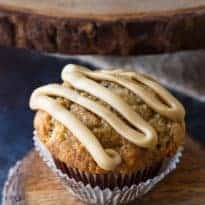 I made these incredibly moist and flavourful banana muffins and topped them with a sinfully sweet ribbon of homemade caramel. So so good. If you have brown bananas wasting away on your countertop or in your freezer, try this recipe and use them up. The browner the banana, the sweeter it will be. Plus, they’ll be super easy to mash up. The bananas I buy at our grocery store are usually green and I have to leave them sit a few days before we can eat them. That’s one downside to this recipe is that you really should wait till the bananas are nice and ripe. I’m sure you could still try and use them, but they’ll be less sweet and harder to mash up. 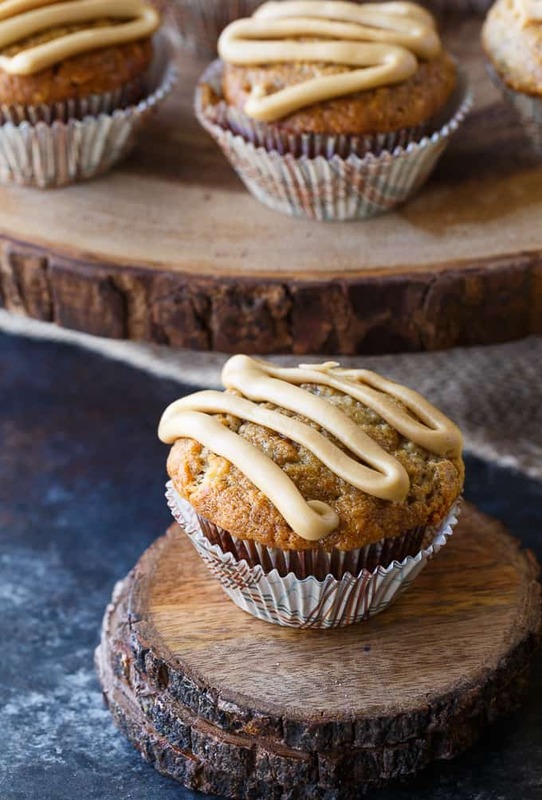 Try one of these Caramel Banana Muffins for breakfast or for a satisfying afternoon treat. This recipe makes one dozen so you’ll have some to share if you like. Check out my other recipes to use up your bananas: Banana Chocolate Cake, Cinnamon Banana Pancakes and Banana Cake with Toffee Frosting. I also have these Lemon Pound Cake Muffins that you might like. You may also enjoy this Caramel Apple Dump Cake. What are some of the ways you use up your brown bananas? 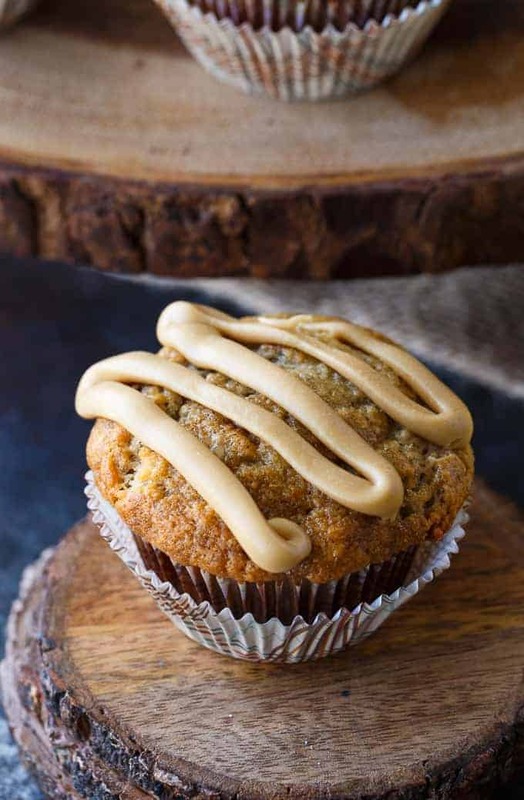 Incredibly moist and flavourful banana muffins topped with a sinfully sweet ribbon of homemade caramel. Preheat oven to 350F. Line a muffin pan with paper liners. Stir together muffin ingredients in a large bowl until combined. Scoop batter into paper liners until 3/4 full. Bake for 25 minutes or until a toothpick comes out clean. Let cool on a cooling rack. Melt butter in small saucepan over medium low heat. Stir in brown sugar and milk and bring to a boil. Remove from heat. Cool slightly. Whisk in icing sugar. Place icing in a small baggie and cut out corner. Drizzle icing over muffins. These sound like the perfect breakfast for me! This is a great combo – have to make soon! Thanks for the recipe. Sounds delicious. And that icing takes them over the top (in a very good way!) for me. 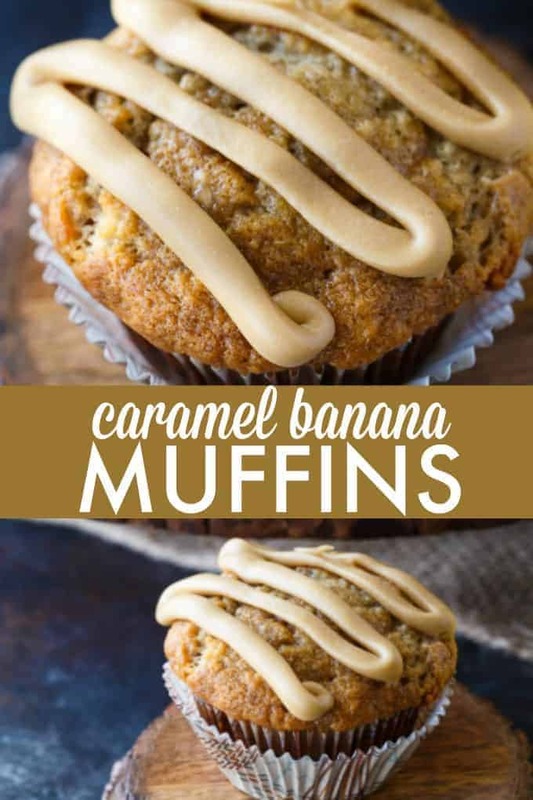 Your Caramel Banana Muffins will be amazing! Thanks so much for sharing with us at our Thanksgiving Edition of Full Plate Thursday! Hope you have a great week and come back soon!